Heat milk, marshmallows and chocolate in 3-quart saucepan over low heat, stirring constantly, until chocolate and marshmallows are melted and blended. Refrigerate about 20 minutes, stirring occasionally until mixture mounds slightly when dropped from a spoon. Beat whipping cream in chilled medium bowl with electric mixer on high speed until soft peaks form. Fold chocolate mixture into whipped cream. Pour into pie shell. Refrigerate uncovered about 8 hours or until set. Garnish with milk chocolate curls and whipped cream if desired. Immediately refrigerate any remaining pie after serving. Milk chocolate is the result of adding dry milk to sweetened chocolate. Because of its 12% milk solid content, milk chocolate is not interchangeable with other chocolate types. Make your kids’ day by decorating their slices with animal-shaped cookies and colored sprinkles. Who knew a pie with just five ingredients could be so decadent? 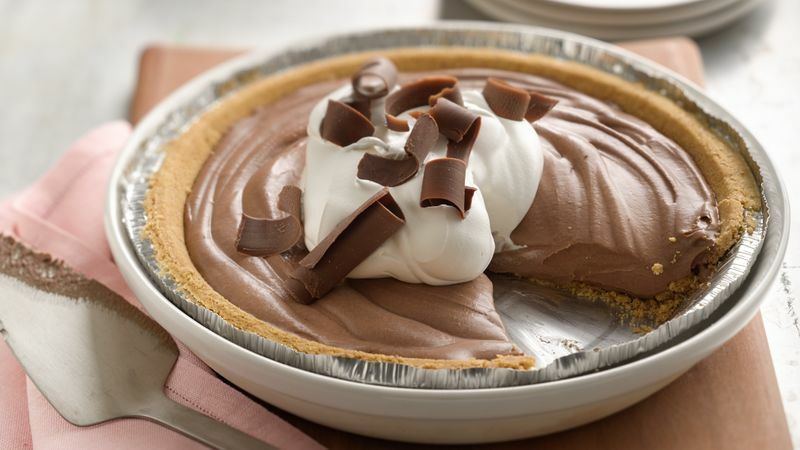 This chocolate cream pie recipe — one of many chocolate pie recipes Betty has up her sleeve!—calls for folding milk chocolate, marshmallows and milk into homemade whipped cream to make a luscious filling. The ready-to-use chocolate or graham cracker pie crust makes this recipe extra easy, but if you’re up to the job, making pie crust from scratch is pretty much always worth it. Whether it’s simple like this one or over-the-top, chocolate cream pie is a favorite for many occasions. Baking up this version for company will make you look like a pastry chef!